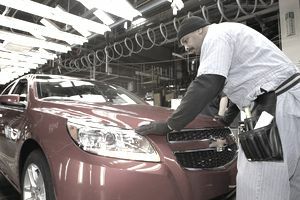 General Motors took the top spot on the 2009 store closing list in May 2009 when it announced that it was closing more than 2,600 of its retail outlets in an effort to keep itself out of bankruptcy court. The total number of jobs that will be lost when all the stores are finally closed is estimated to be 130,000, which also puts GM at the top of the retail job cuts list for 2009. GM wasn't able to keep itself out of bankruptcy court, and when the company filed for Chapter 11 on June 1, 2009, it wasn't only the largest bankruptcy of the year for the U.S. retail industry, it was also the fourth largest bankruptcy reorganization in the history of United States business. It may have been one of the biggest, but it was also one of the shortest bankruptcy reorganizations processes in history, lasting just 40 days. What follows is an overview of GM's Chapter 11 bankruptcy proceedings and the transactions that allowed the brand to survive, and a new government-owned company to emerge with a fresh start in the U.S. auto industry. The U.S. government and the Canadian government are providing $30 billion to the company to continue operating while in Chapter 11. Edward Whitacre, former CEO of AT&T was appointed as chairman of the board. A proposal to form a new entity that would be owned 60% by the U.S. government, 12% by the Canadian government, 17.5% by the United Automobile Workers union, and 10% by G.M. bondholder has been presented to the court for approval. Court papers state that they have no other viable alternative and if the proposal is not approved, the company would be forced to liquidate. The U.S. government is backing GM vehicle warranties during the Chapter 11 process. The new GM is expected to assume responsibility for product liability, "lemon law" violations and workers' compensation claims. The company plans to sell its Hummer and Saturn brands, and discontinue the Pontiac brand. The reorganization plan presented to the bankruptcy court on June 30 is estimated to have 750 objections. In April 2015, GM returned to court before the original bankruptcy Judge Robert Gerber and argued that the company should be shielded from current class action lawsuits related to vehicles produced before its bankruptcy which have been recalled for numerous defects. Judge Gerber ruled in favor of GM, which means the company was shielded from billions of dollars in claims related primarily to defective ignition switches which were blamed for accidents and deaths.